The call of the land creates strong ties, ignites deep passions, and inspires dreams that can become reality. Everything that happens, is a product of the path we choose, even in the face of ongoing challenges. Five men, each with their own story, all sharing an identical passion, found themselves cultivating the same dream. Wine is the common thread that connects their five stories, united and strengthened by the land and daily work upon it. Filodivino has found its home in the Marche, a place close enough to be discovered, and yet far enough away to be a destination. Destined to become an entrepreneur. He first studies physics then IT, but he is never really enraptured by either. He prefers to get his hands dirty, to take things apart and rebuild them from scratch; he likes to understand where they come from and their inner workings. In 1986 he begins working for his father Dino’s business. The lessons he learns there are invaluable, but after a while he decides it’s time for new management. Francesco, Gian Mario and Paolo are the men for the job. Their friendship blossoms and, together, they develop a business and build new relations. The economic crisis strikes but, with their strength as a group, they are able to pull through. With his friends beside him, Alberto begins a new journey. He heads towards Le Marche, towards the world of wine and towards the creation of an emotional product with excellent sensory characteristics. The sea and sailing, which he sees as a microcosm of the power of community: relationships are as vital in calm waters as they are in the face of a storm. Sailing taught Alberto important life lessons, such as how to always achieve his goals by working with others towards them. Filodivino has inherited Alberto’s welcoming nature. Sharing wine is just a small part of the welcoming atmosphere at Filodivino. It was Alberto that shaped the project, widening the concept of a vinicultural business to transform it into a home. Travellers are welcomed like family and given the chance to share in the work and passion that defines Filodivino. Without his tenacity and sophistication, the Filodivino we know today would not exist. A traveller’s spirit, always driven by the prospect of discovery, always open to new experiences. He graduates in Political Sciences and then obtains an MBA at Milan’s Bocconi University before continuing to work, experiment and explore. He takes most pride in his family and especially in his two wonderful daughters, who fill him every day with energy and enthusiasm. He sees his decision to settle down in Le Marche as a final journey. Wine was the key factor and driving force behind this choice. This passion for wine is the inextricable bond between the professional and private life of Francesco and the rest of the group; it is what pushes him to shape his own future. Travel, food and photography. His love of nature takes him travelling and drives him to discover new things, to experience the uniqueness of each place he visits – including the cuisine. Photography helps Francesco preserve moments, people, experiences. Francesco is the reason Filodivino has an international vision, a hunger for knowledge and a desire to innovate. He ensures Filodivino pursues its objective of offering a high-quality service, at the same time keeping it authentic and – simply put – enjoyable. Born into a family that has cultivated grain for generations, the countryside runs through Gian Mario’s veins. As a child he drives the tractor as his uncle and father load it with straw and hay. He later decides to enrol in an Economics and Business course, during which – thanks to a dear friend – he falls in love with Le Marche. It’s like being struck by lightning: its colourful hills, its authentic flavours, the kindness of its people. The lightning strikes a chord with his deep bond with nature and agriculture, keeping him tied to the region year after year. When, with a group of friends, he ponders how best to reinvest the proceeds from the old company, there is no question: a vineyard is the only option, especially one located in the slice of land that links Jesi and Senigallia, the home of the Lacrima and Verdicchio varietals. Wine of course, his first love. He also loves running: 5 kilometres every day. And he is a collector of antique coins, Lire from the Italian Republic, in particular. Finance is another passion of Gian Mario’s which, of course, is part of his job as well. He is a traveller at heart, but does not travel as often as he would like: he prefers to travel when he can take the time to immerse himself in the customs and daily life of the places he visits. The choice to invest in agricultural land and, moreover, to do so in the magical land of the Le Marche region. Matteo always dreamed of becoming a viniculturist. This passion had little Matteo following his grandfather through the vineyards during the summer holidays, before he set to formally studying the practice. A degree in Agriculture is not enough and he goes on to specialise in Oenology in Florence. Even as he learns the very basics of agriculture, he is able to put them straight into practice. His enthusiasm for wine grows rapidly as a result. Le Marche, however, is too small and Matteo decides to go further afield. Tuscany becomes his “second home”. He comes into contact with processes and varietals that differ from the traditional ones he has seen in Le Marche. It is here that he gets the inspiration to launch a start-up. He later heads to California, where he learns to appreciate the world’s wines. It broadens his mind and infects him with an unstoppable lust for life. In Australia he learns about Custom Crush processes. Gaining the perspective of experts, he begins to form new visions of his own. Finally, it is in Greece that Matteo has the opportunity to run a business. He is responsible for making crucial choices: from label changes to producing wines with different blends. 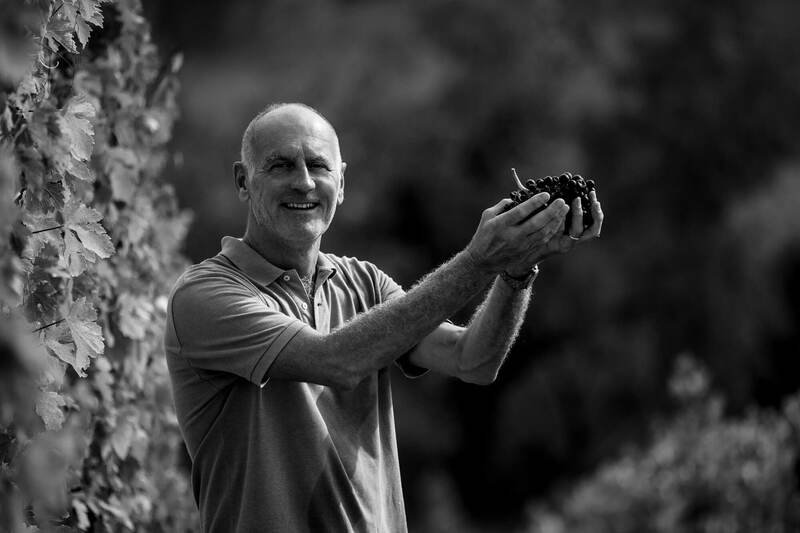 He returns home with a wealth of experience that supports his decision to start his own business – the Angeli di Varano – and to embrace the Filodivino project, becoming their oenologist. It’s easy to fall in love with the group’s passion. The mutual respect is natural – all it takes is a simple handshake. His biggest passion is taking on an oenological challenge. He is fascinated by new projects and his constructively critical thinking allows him to go beyond the mere facts to grow professionally every day. His favourite wine is one that is yet to be produced. It was Matteo that knew how to make the most of the less-than-perfect grape harvests, working step-by-step to create aroma and flavour where it didn’t seem possible. He has always worked with Filodivino’s grapes as if they were his own. The city of Milan flows through his veins. Paolo has a natural ability to meet the demands of the economy and of his clients. His professional career is set against the backdrop of the manufacturing industry, with a focus on project planning, fast turnaround production and profit maximisation. Nature doesn’t feature: everything must be done as quickly as possible with a view to making the largest profit. But one day he realises that fruit and vegetables don’t just appear on supermarket shelves. He becomes aware that humankind needs to respect the produce that we rely on. Production should take place in harmony with the seasons and their varying conditions. He sees Filodivino as a sort of renaissance: it is the celebration of a lasting friendship, of devotion to a product that is helped by the contribution of the whole group, but that can’t succeed unless it follows the rhythm of nature. Having fun and healthy competition. They were the driving forces of his youth and they remain with him today. The mountains have been a part of Paolo’s life since he was a child and skiing is one of the things he does best. At a more mature age he fell in love with sailing and regattas, not forgetting, of course, the biggest adventure of all: becoming a father at 50. And finally, travelling, exploring, learning, walking; anywhere, from Patagonia to Laos, Nepal to Namibia, and so many places all over the world. Paolo came up with the name Filodivino, inspired by the personal and professional stories that brought the group together. From the play on the words “divino” – for divine, heavenly – and “di vino” – meaning “of wine” – we get a sense of the partners’ passion for wine. That passion is the “filo” – meaning “thread” or “bond” – that not only aligned the partners’ professional and personal lives in the beginning, but that continues to fuel their Le Marche adventure to this date.